Melting industrial mischief and psychedelic substances, Denver, Colorado’s LSD_25xp lives up to its name. 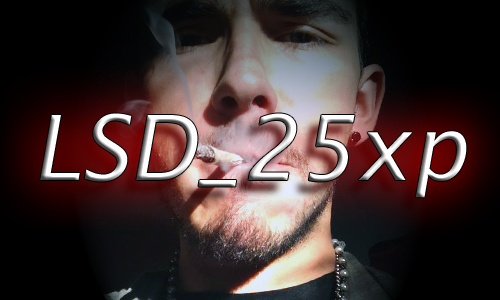 Calling upon the sleaze of TKK and PIG while letting a love of horror soundtracks burn brightly, ReGen Magazine now presents to you LSD_25xp’s entry on The 6ix List! Tell us a bit about what you are up to musically? Fante: Currently, I am debating on doing a local Colorado tour or releasing another album; not much to say about either yet as they are still in the works, but I have some fun things brewing in my mind and they need to come out. I’ve also been itching to do the film associated with The Road Kill Rituals album, but that is still on the drawing board and cannot be confirmed yet. Fante: Oh, so many reasons go into these selections – musical style, inspiration, brilliance in all aspects of their genres. Les Baxter inspires me on more of an easy listening level, helping to inspire me with those groovy satanic smooth jungle beats. My Life with the Thrill Kult… well, they inspire me to be bolder, their song structures, beats, sounds, and lyrics are a beautiful chaotic mix of neon dayglo rhythm laced with vibrant hallucinations. PIG, ohGr, and cEvin Ky I feel can be placed in the same reasoning as TKK, but they just have vastly different styles and each possesses its own unique quality. Now, we get to the beautiful and amazing being that is the pure PANdrogyne, Genesis Breyer P-Orridge, a keystone in the foundation of the industrial/experimental genre. There were none before them and there will be none after them. They are truly very unique and special and more people need to hear their message. Fante: I choose these albums because they just reiterate my point above of how influential these groups and individuals have helped provide the inspiration that fuels the machine that is PaPa BetA in LSD_25xp. Psychic TV – Towards Thee Infinite Beat (1990). My Life with the Thrill Kill Kult – Confessions of a Knife… (1990). PIG – Genuine American Monster (1999). cEvin Key – The Ghost of Each Room (2001). Les Baxter – The Dunwhich Horror: Original Motion Picture Soundtrack (1970). Man… the world is probably the most inspiration of all, and the misery inside the world is too hard to bear, so I create music, paint, and write, all with the idea that it may help relieve some of the burden the world bears down upon us. The occult and spirituality, the belief that certain notes can alter the perception of people and their surrounding environment. I use a lot of samples from occult documentaries and other sources to convey the message of the otherworldly secret knowledge that we are not allowed to know or that we do not have the mental capacity to understand such knowledge. Drug use or the use of hallucinogens – particularly, LSD, Psilocybin, DMT, Peyote, and Marijuana. The reason for this is to show how the world needs to take things in moderation. We take drugs to an extreme, we experiment with them, and do not understanding that it’s the experience our soul needs as opposed to the thrill of the ride. It’s the difference between an active doctor and a student dabbling in animal vivisection. My husband is and always will be my rock, supporting and motivating me in any endeavor I wish to partake in. Religion or the institution thereof is another inspiration and its heady hypocrisy is just delightful to sit back and watch. Last but certainly not least, our government, but I refuse to give ear time to that bloated rotten apricot in the oval office. The more time he gets, the stronger his influence becomes. I like to focus more on the problems that got us as a nation to where we are today.